Created in 2011 by Libby Limon, a degree qualified nutritional therapist and Vinyasa Yoga teacher, this holistic yet attainable plan has been developed, tried and tested and is now available at the hip fitness studio - FRAME. With the media awash with a multitude of ways to tone up, lose weight and eat ’healthily’ – its difficult to know where to start. REBOOTCAMP guides you through the latest nutritional science including energy balancing, the alkaline diet, nutrient timing and juicing - allowing you to include them in your every day life in a practical and achievable way. REBOOT CAMP helps you understand your body and its needs. You will develop a sustainable way of eating, exercising and living for optimum results. It will rebuild your confidence in the choices you make to leave you feeling the very best you can. 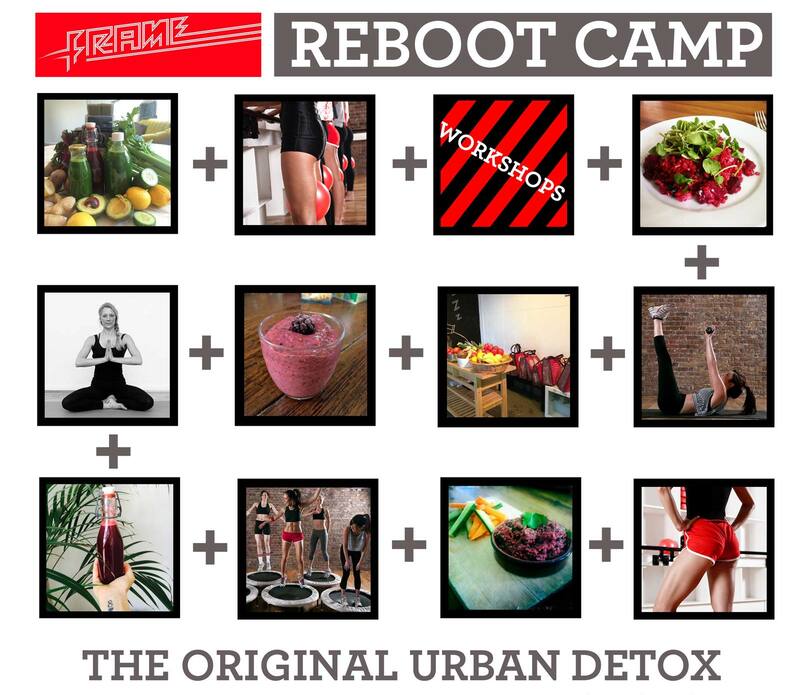 REBOOT CAMP provides all you need for the week including; 7 day plan to nutritionally cleanse and re-energise the body, 7 day personalised plan of Frame studio HIIT, resistance and restorative exercise classes and workshops, 7 days of daily juices/smoothie to optimise rebooting, 7 days menu plans (including take-out options) recipes, shopping lists, daily motivational emails with tips and tricks to remaining focussed. Feel stronger and leaner * Improve mental focus * Boost metabolism * Improve acid/alkaline balances in the body * Feel revitalised and energised * Improve sleep * Develop a positive mental attitude in all aspects of life * Balance immune system * Achieve glowing skin, healthier hair and nails. "The whole experience really changed my view on fitness, before I really used to see it a chore and now I see it more as time well spent." "It has been wonderful having a menu plan, set recipes, set snacks etc. as well as the list of alkaline foods so I can assess other meals (including take out options). Looking forward to the rest of the week and taking these principles with me beyond as well!!" "I'm feeling really energised and my skin looks amazing after the juice weekend." "Can't thank you enough - this has been a mega turnaround point for me." "It's really changed my approach to fitness, wellbeing, and made me be far more thoughtful about what I’m putting in my body... which was way more than I expected from seven days." Welcome meeting, nutrition seminar and Q&A – held at FRAME Shoreditch. REBOOT handbook with scientific explanations, principals for making it work and specific menu plans, including recipes, shopping lists & take options. Clear and easy to achieve wellbeing advice on diet, exercise, lifestyle choices. 7 days of juices and superfood smoothies, freshly juiced in-house, available to pick up from your preferred FRAME studio. Daily email support, tips and updates. Restorative yoga workshop hosted by Libby Limon (2 hours). FRAME Signature/fitness/dance or yoga classes. £179 for the one week - no membership required. REBOOT CAMP is available for the discounted rate of £120 (one week) for existing FRAME full members. For the next dates please see Frame website.